Its finally here! Facebook is all set to launch its official streaming channel called Facebook Live! The launch is set for today at 3 PM PST (6 EST). Actress America Ferrera will launch the Facebook Live from its headquarters in Palo Alto and announce the details of her new movie “The Dry Land” using Facebook Live. Facebook said in an official announcement that it will use the Facebook live for announcements, press events, live chats with Facebook engineers and live streaming of its developer conference, F8. Apart from these Facebook wants to grow beyond and include a streaming service similar to Youtube and Hulu. 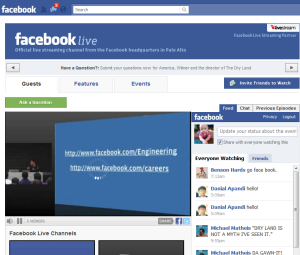 Facebooks real-time live feed technology will also work as a video conferencing tool. Facebook is also working on an Facebook Live app that can be added to the facebook page. The video here is hosted by livestream for facebook. You can check out Facebook Live here.